Are you now channeling Dean Martin and singing about pizza pie? 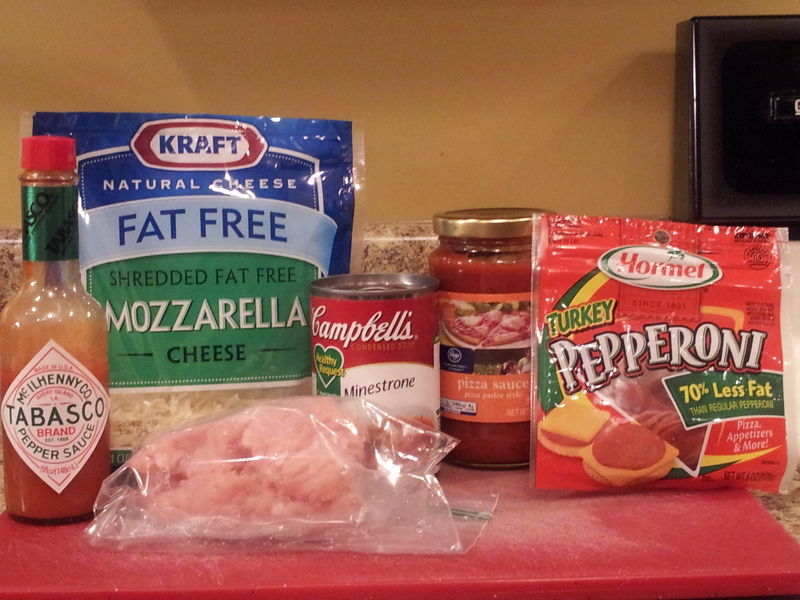 Can you guess the theme of the recipe I’m sharing today? The husband and I love hot wings. And we love pizza. Again, things that are not so great for you when you’re trying to shed a couple of pounds. So I found a way to make the diet work for me – not me work for the diet. And it makes me more child friendly too. I forgot how amazing this was – so now I’m sharing the amazingness with you. Make this. Make a bunch of it and have some leftovers at lunch. Your co-workers will be jealous. And then you can share it with them – if you’re feeling generous. Heat your saucepan to medium. 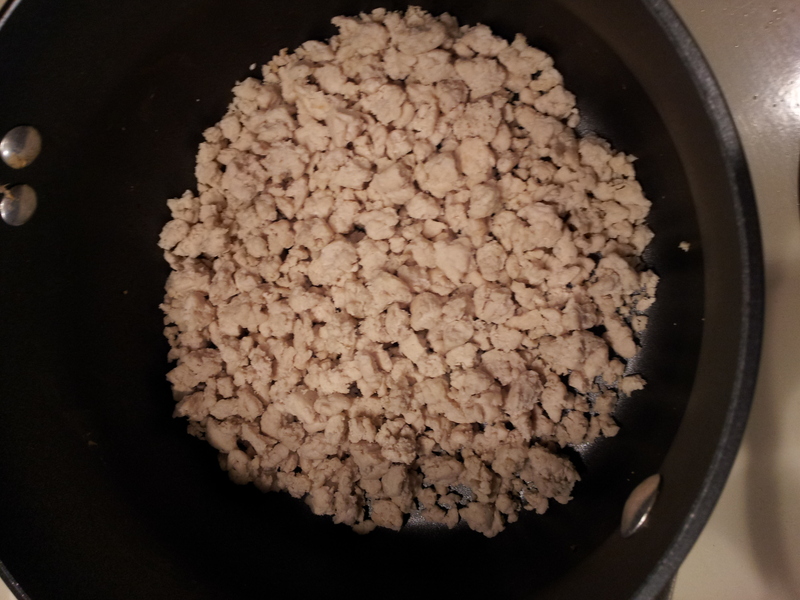 Cook turkey, breaking into crumbles as you go. Drain if needed. Reduce heat to medium-low. 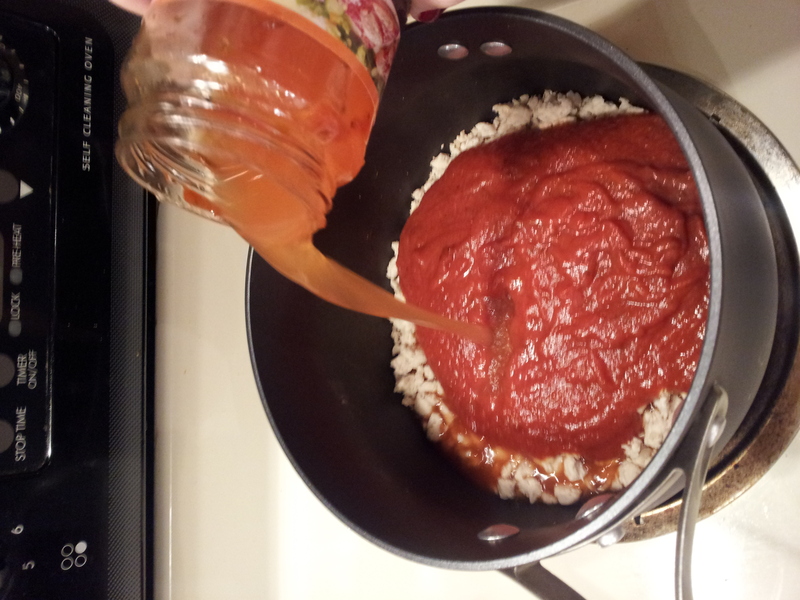 Add your pizza sauce. Then, refill the jar with water and add water to saucepan. Stir to combine. 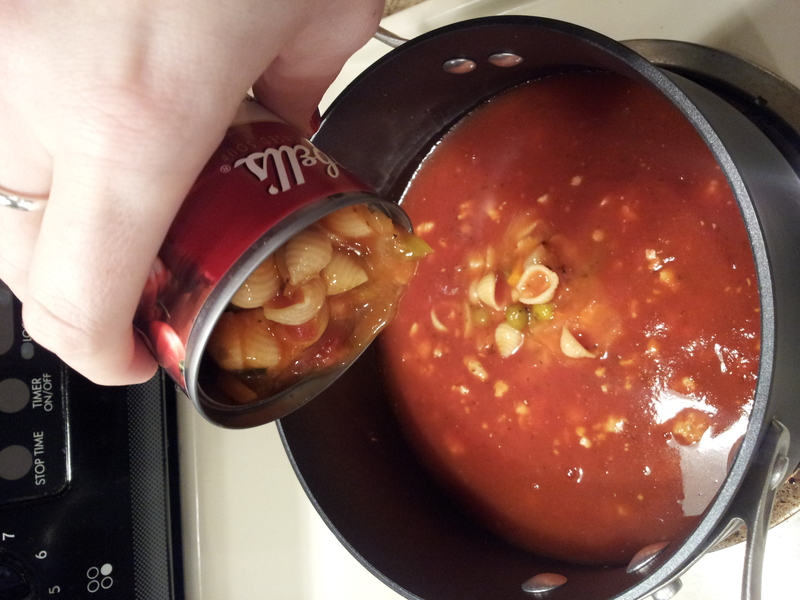 Add the can of Minestrone soup, stir to combine. 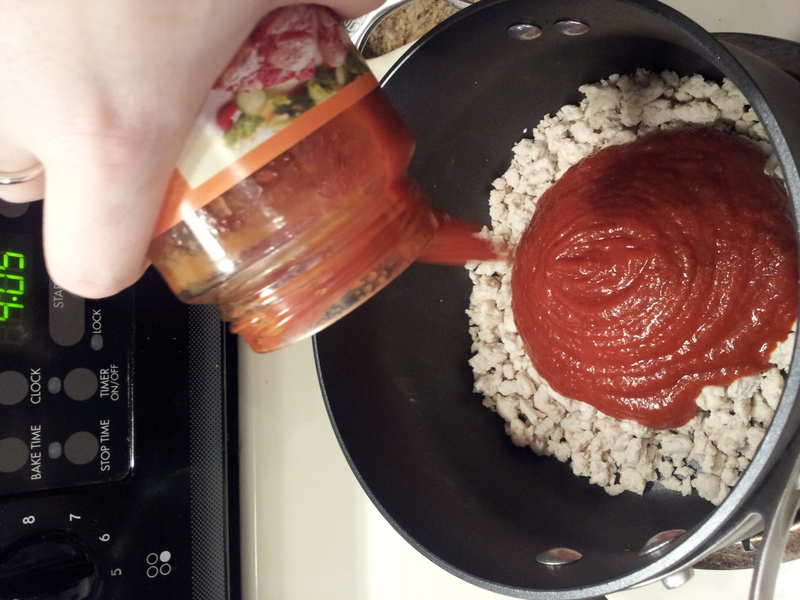 Add Tabasco sauce, salt (about 1/4 tsp.) and pepper (about 1/8 tsp.) and stir. 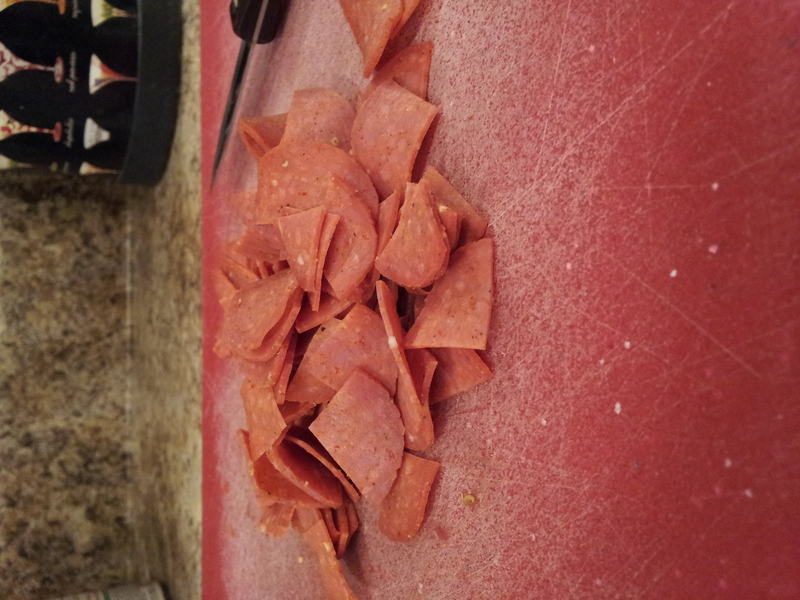 Slice your pepperoni into halves and quarters (I do about 15 each way) and add pepperoni to the saucepan. Mix well and cover. Cook for about 15 minutes until bubbling, then reduce heat to low and simmer for 5 more minutes. Serve soup and top each bowl with 1 Tbsp. 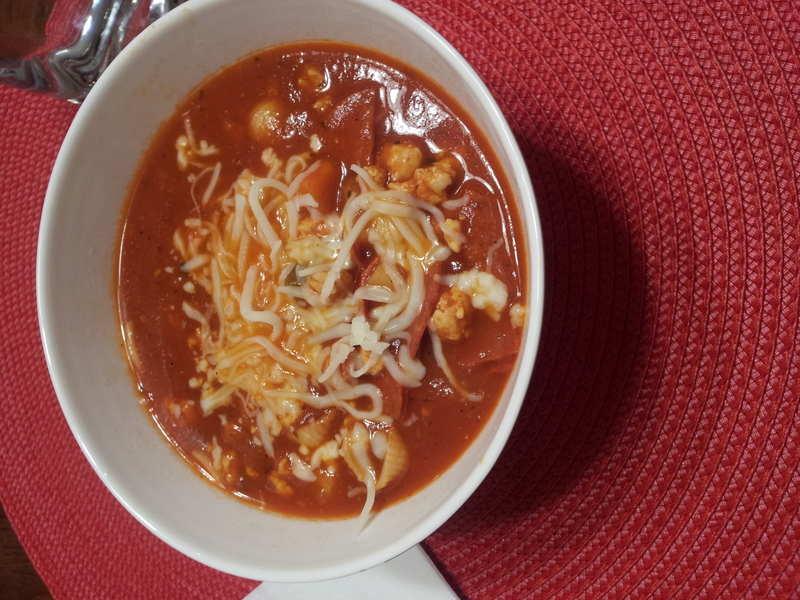 shredded mozzarella. Yes, that’s it. A meal that is warm, delicious, filling and ready in about 30 minutes. I don’t normally go all out for Valentine’s Day. Don’t get me wrong – I like the sentiment…but I usually just cook a nice dinner, have some wine, exchange some cards and call it a day (although getting flowers never hurts). This year, however, is a little different – because I got to pick one of the sweet “husband” cards! The husband and I have only been married a little over 4 months, but it makes me so happy to know that I have many more years ahead with my best friend. He is an incredible man and he is so good to me and I only hope I can make him as happy as he has made me. So a day dedicated to saying “I love you” when you’re in love can’t be bad, right? It didn’t take long for the husband to sample my cooking when we first started dating, as I loved cooking and well, I had often heard that the way to a man’s heart was through his stomach. Like, seriously. There are some other ways that can get you there, but they are like scenic routes. So what is something my husband loves to eat? Hot wings! (Me too – could eat them all the time). What is something that is really hard to make diet-friendly? Hot wings! 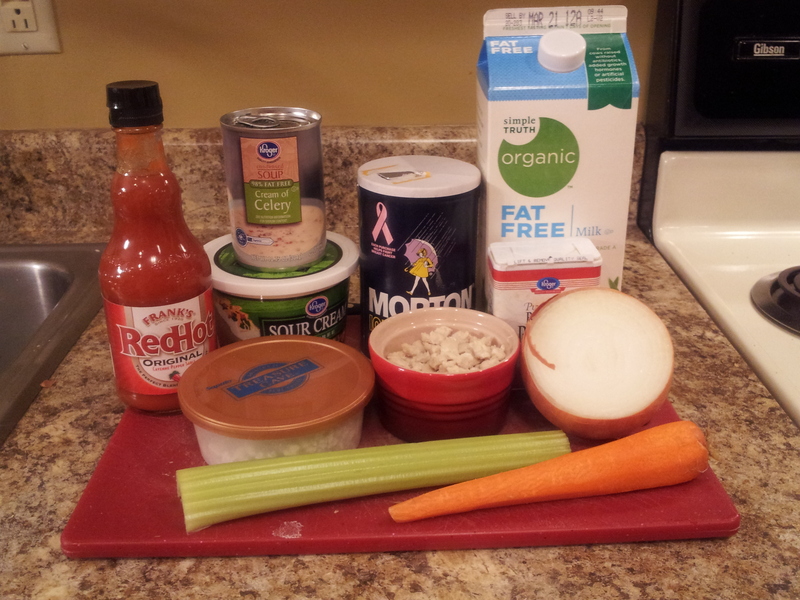 Okay, so I do make diet-friendly hot wings – but they can be a little time-consuming – and sometimes I just don’t feel like making side dishes. 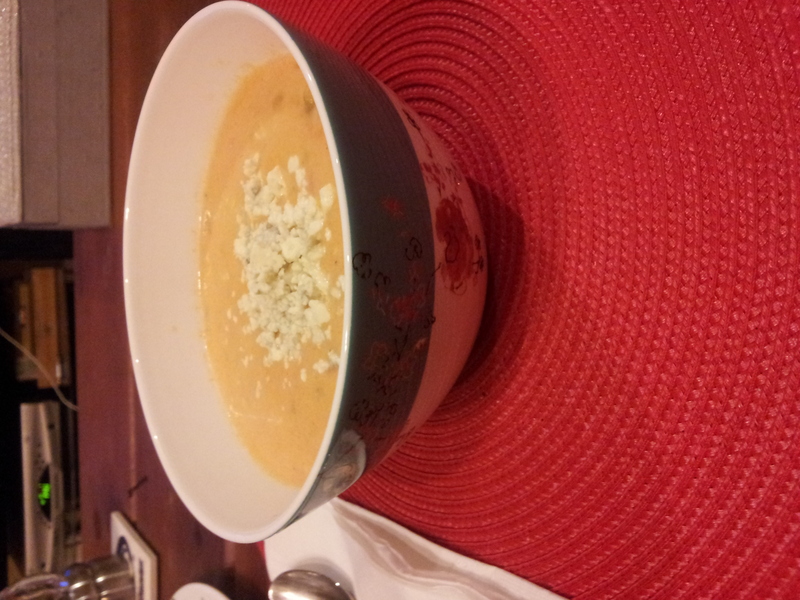 Enter buffalo chicken soup. That’s right people…I said it. I went there. Buffalo. Chicken. Soup. If you’re looking for a super easy recipe that is action packed with flavor AND something you and your honey will love – look no further! 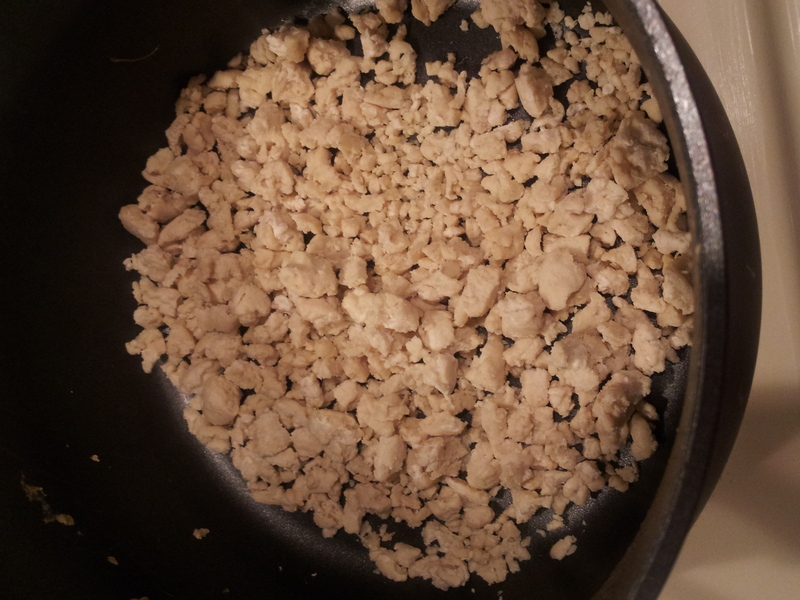 Cook your chicken and crumble in a large pot. Set aside. 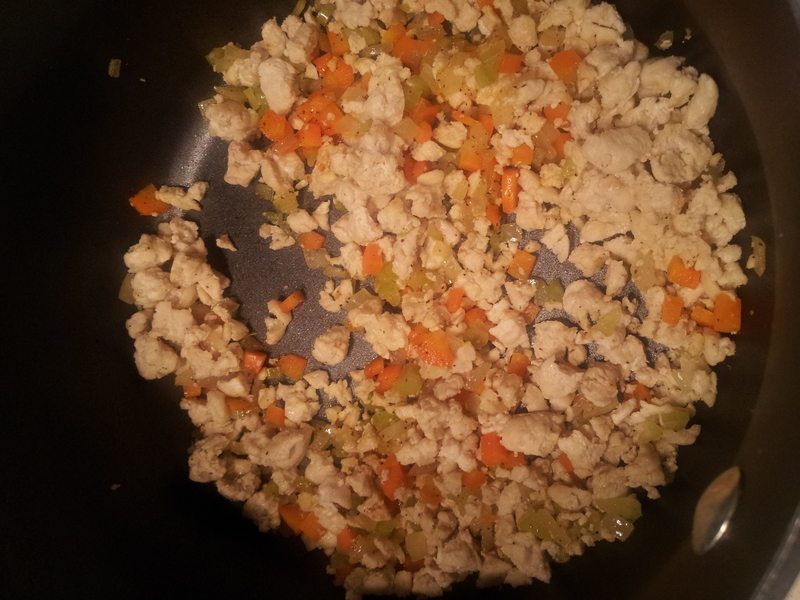 Add margarine to pot with celery, carrot and onion. Cook 5-7 minutes over medium-high until softened. Reduce heat to medium low and add chicken. Stir and cook an additional 2-3 minutes. Pour in milk and stir, careful not to scald. 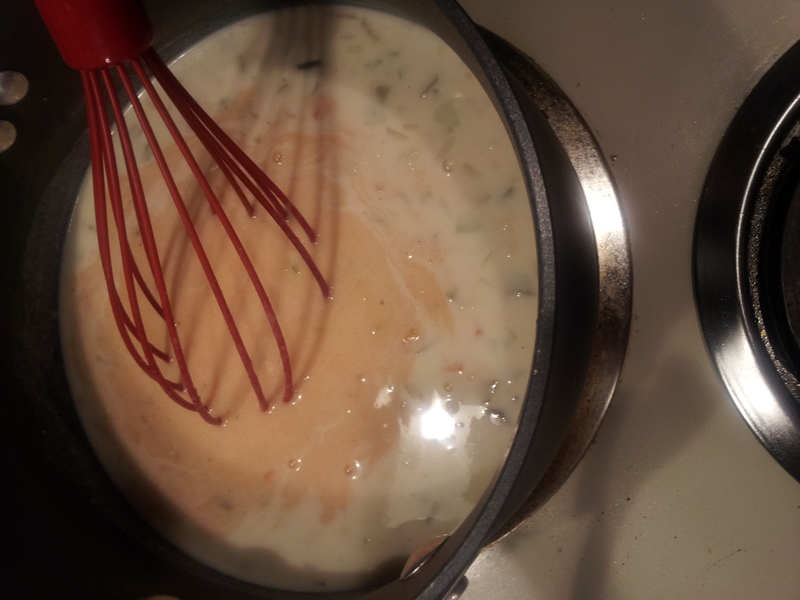 Add sour cream and soup and whisk until smooth and blended. 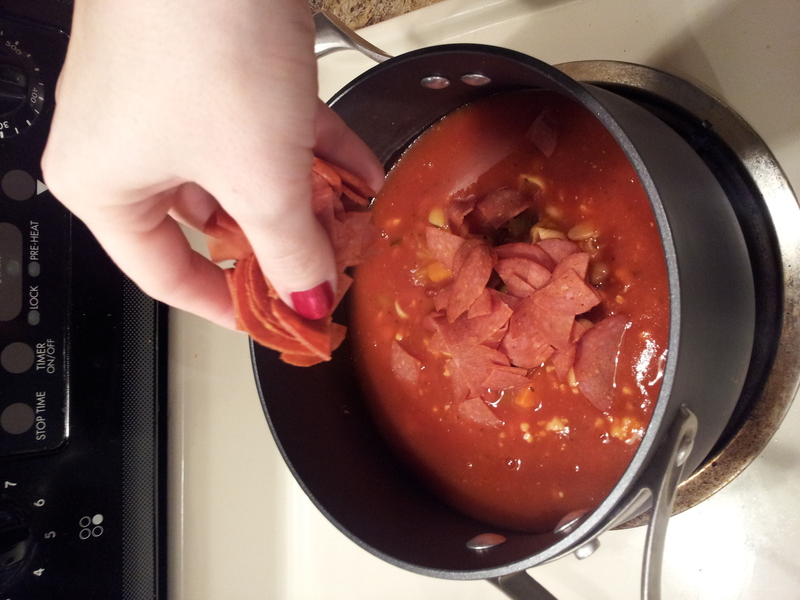 Now add in your hot sauce, which will give the soup a pretty pink-ish color! Cover pot and reduce heat to low. Cook about 20-30 minutes, bringing to a light simmer. Careful not to boil! Taste and add more hot sauce if needed, or you can just add it to individual servings if you have two separate heat tolerances to appease! Serve with 1 Tbsp. blue cheese crumbles on top. We also like to have a slice or two of french bread for dipping with ours! See…the perfect way to “spice up” your Valentine’s Day!